Let true communication with God become a reality for your students! 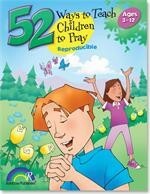 These 52 crafts, puzzles, classroom discussion guides and other activities will help kids make prayer a part of their daily lives. For ages 3-12. 64 pages.